Home > Browse by Artist (E-K) > F > Ferris, Stephen J.
Stephen J. Ferris etching "After a Good Day's Sport"
Medium: etching. Etched by Stephen J. Ferris after the F. O. C. Darley drawing. 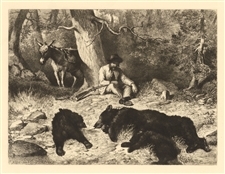 Printed on cream wove paper and published in 1888 for "Picturesque California: The Rocky Mountains and the Pacific Slope". Image size: 8 1/4 x 11 1/4 inches. Signed in the plate, not by hand. 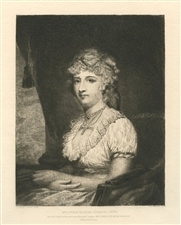 Stephen J. Ferris | Gilbert Stuart etching "Mrs Nicklin"
Medium: etching. Etched by Stephen J. Ferris after the Gilbert Stuart painting. Printed on cream laid paper and published in Boston in 1888 by Estes & Lauriat. Image size: 7 1/4 x 5 5/8 inches. A rich, dark impression. Not signed. 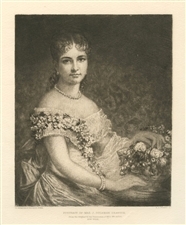 Stephen J. Ferris etching "Portrait of Mrs. J Coleman Drayton"
Medium: etching. Etched by Stephen J. Ferris after the Daniel Huntington painting. Printed on cream laid paper and published in Boston in 1888 by Estes & Lauriat. Image size: 7 1/4 x 6 inches. Not signed.